Imagine a place where the patients roam the halls yelling and screaming walking around in a daze because of shock treatments all through the night. They would pound and bang on doors at all hours. Therapy shock treatments like lobotomy, fever cabinets and who knows what else for mental illness. Even reports of government experiments on patients. 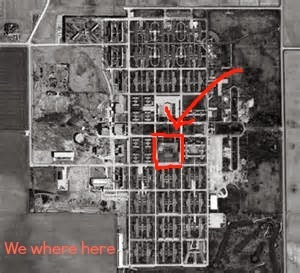 If you weren't crazy when you went in, there's a good chance you would be when you left. Opened in 1929 and closed 1985 ...over 8,000 patient at once with just a little over 200 medical personnel this place is one for the books. It's no wonder people claim to hear screams, cries, yelling and more. One reason a spirit stays attached to a place is because it is a place with a great emotion. Whether the emotion is happy or sad, spirits stay. I would say this place has it all!!! I love these guys!!! And Michele (founder and lead investigator) is just fantastic! Thank you White Dog Paranormal for letting me tag along....it was AWESOME!!! As we crawled in a broken door way, being very careful because everything was slick and wet...at first sight (even in the dark) you can't but help feel all the activity that once was inside these walls. Although the floors were soaked with water because of the rain we were able to find very small area's that we could set up our equipment. 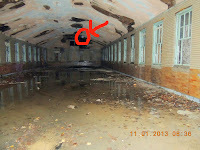 Without getting to detailed, let me tell you that we heard voices, some of children, saw balls of light, heard footsteps, saw shadows again and again and even near the underground basement that reportedly has underground tunnels attached to them so they could take the really unruly patients from building to building without going through the main entrance ....we heard GROWLING!!! Yep.....GROWLING!!! 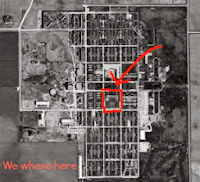 The basement area BY FAR...was extremely creepy! We had some great flashlight communication and have some really awesome EVP's that I hope to post soon. We still are going through our evidence. Below is one of my FAVORITE photo's that Anthony with White Dog Paranormal caught inside. This is what I call an Eco Mist. It is a spirit that is trying to manifest itself. This is an AMAZING photo!!! 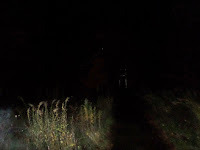 For a ghost hunter....catching a photo like this is kinda like winning the GHOST lotto. LOL You can see to the right side of the photo a very intense mist. And before you even say it.... no. It wasn't someone's breath. You can see the location of AJ, an investigator with White Dog Paranormal and you can clearly tell that the mist is WAY above his head and on the far side of the room. There is just soooo much to write about on our experience at Manteno that I am really struggling to try and keep this short. 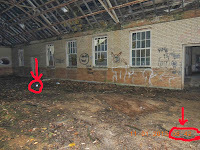 The next pic.... another unbelievable photo that Anthony also caught outside the entrance of this abandon place... I am beginning to wonder if there may be a portal to the left side of the main entrance. For whatever reason.....the outside of this building just in trigged me. I just kept wanting to go investigate near the front entrance. Can you imagine if you were walking up to this place....first.....seeing this size of the place and then hearing screams and cries coming from inside, knowing this is where you were going to be living??? The FEAR must have been crazy! (pardon the expression LOL) First, you will see in MY photos(All the ones posted below are my original photos)number #7 and #8 that I believe shows the entrance to a portal because in photo 8. There are TONS of orbs or spirits clearly seen here and in the photo actually number 7 is taken immediately AFTER 8 and all the orbs are gone!!!! Within secs, they are GONE!!! So, it couldn't have been dust...for two reasons...it had been raining and had stopped and second...because we had not been on that side of the building AT ALL so we couldn't have stirred anything up! You'll notice the timestamp for proof. 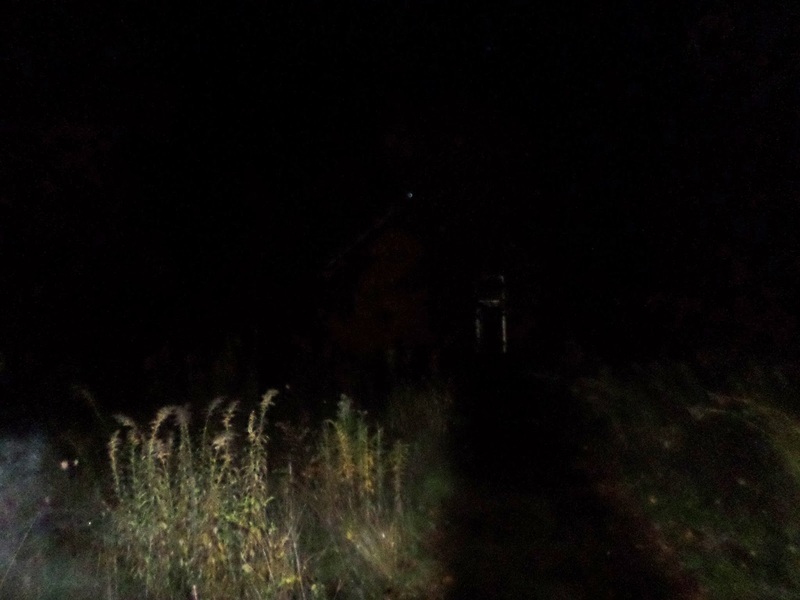 This is sometimes an indication of a portal with two back to back photos and one having tons of orbs and the very next shot having absolutely none. That along with Anthony's photo below showing again....another eerie MIST makes me really feel there is something definitely there!